2019 is shaping up to be an unforgettable one as far as student performance opportunities and experiences go, and we're ready to get your group signed up, booked, and ready to go! 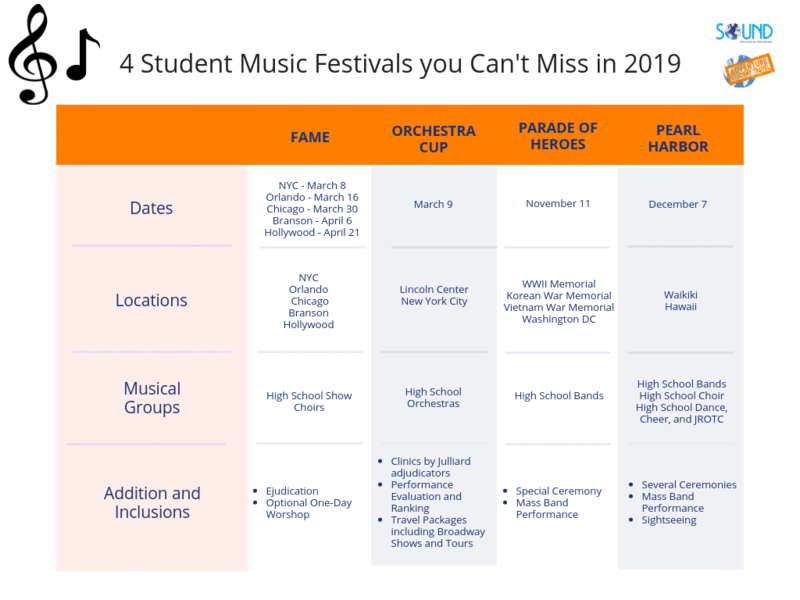 Adventure Student Travel is working with SOUND Education Programs to bring you the best of the best in music festivals this upcoming year, and today we are featuring our top 4 choices for Student Music Festivals you Can't Miss in 2019! For over two decades, SOUND Education Programs and it's professional partner organizations have provided thousands of outstanding music students the opportunity to travel to and perform in historic destinations worldwide. These students have experienced educational excellence as they learn of other cultures, world history along with the music that marked the time. The FAME Show Choir National Championship Series, or SCNCS for short, provides the nations top show choirs the opportunity to strut their stuff in 5 different cities across America. This is a massive opportunity for any serious competing show choir, and the options for performance spots include NYC, Chicago, Orlando, Branson, and Hollywood. The Orchestra Cup is for all the finest high school orchestras in America, a unique opportunity for students to perform in an adjudicated setting at the Lincoln Center in New York City. Judges from Julliard will be present to evaluate and rank your group, and there are several options for extended stays/sightseeing while in the city! In Washington D.C your group will find a 'monumental salute to our veterans' on Veteran's Day each year, the Parade of Heroes including a parade, special ceremony, and mass band performance. The performances take place at the WWII, Korean War, and Vietnam War Memorials and honor those who served in each respectively. The Pearl Harbor Memorial Parade is a grand performance located in Waikiki that commemorates the anniversary of the invasion of Pearl Harbor (December 7th, 1941). This event supports the motto 'remember the past, celebrate the future' and features various performance opportunities including a parade, a mass band and choir performance, and several small ceremonies throughout the entire weekend. The main event, the parade, will take your group from historic For DeRussy to Kapiolani Park, showing you all the finest sites of the gorgeous streets of Waikiki. Check out all the specific dates, locations, and inclusions below, and for more performance options check out our performance trip theme page, and then check out the helpful blogs below!